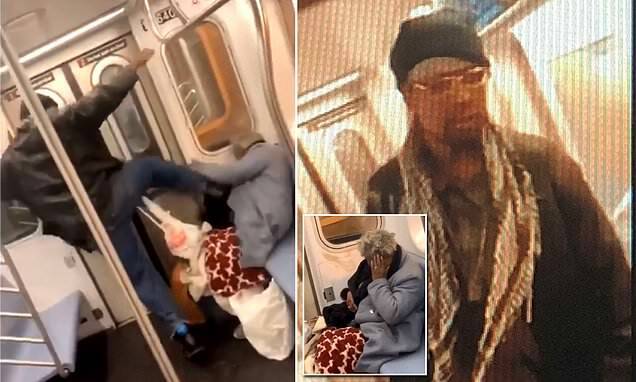 Police are looking for a man who repeatedly punched and kicked an elderly woman in the face and body in an unprovoked attack on a subway. Horrific footage of the incident was posted on Twitter and shows the man assaulting the 78-year-old victim as she is sitting on a northbound No.2 train at around 3 am on March 10. The woman, who was alone, tries to defend herself as he continues to attack her while other passengers record the incident and do nothing to help. He can be heard saying 'Who the f**k you was talking to' as he finished his brutal assault. Shortly before he turns to the passengers filming and says: 'Worldstar that my n****r' in reference to the social media page that is full of violent videos. The man exited the train at 238 Street / Nereid Avenue and fled on foot before authorities had a chance to apprehend him.